Ready to build your career, network with industry professionals, and get feedback on your portfolio or resume? SMAD Day brings together students, alumni and faculty for informative career sessions and networking opportunities. Sessions will cover careers, portfolios, resumes, interviewing, and more. Presentation followed by outdoor demonstration. Award winning multimedia journalist will present his latest project and speak about the stories behind the stories. The world leading consulting firm provides information about internship and job opportunities. This session explores ways to capitalize on academic strengths, experiences, talent, and media skills. The discussion will include how to market yourself, build a professional network, tips and ideas to create your own opportunities, and best practices for securing an internship or a job. SMAD Dog Day will take place in the on the lawn behind Harrison Hall. Join professors, staff, and other students in a fun social event. SMAD students get free hot dogs and refreshments. 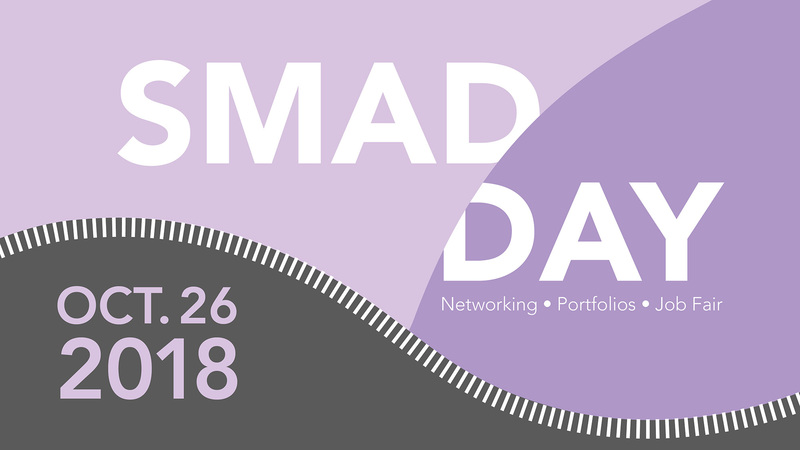 SMAD day is a unique opportunity for you to get expert advice from professionals in the Media Arts field. Sessions cover important, real-world information about today’s job market, including entrepreneurship, self-employment, graduate school, and further education. Every SMAD concentration will have a dedicated career panel, as well as time to get their resume or portfolio reviewed by SMAD alum and Media Arts professionals. Students can sign up on JMU’s Alumni website to reserve a time for a specific professional to review their resume or portfolio pieces. These professionals will also be avilable in the concentration-specific career panels, where students can explore what SMAD alum and other media professionals do with their degrees.